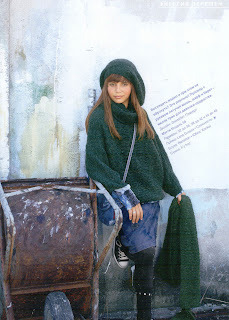 The pattern is #61 Kitty from Verena magazine Winter 2010. It took me three attempts to get the look I am satisfied with. First I followed the pattern description precisely and the result was good but good for the teenager. Actually the pattern is from the teenager's section of the magazine, so no wonder. It looked 'almost' like this one, falling on my back and shoulders. I unraveled it and made it again this time using needles #3. It was too small. Finally I used only needles #3,5 and knitted exactly 28 rows of square pattern for the main part. Now I feel more comfortable with it. For the scarf I used the same pattern and remainders of three different yarns in different shades of blue. I would recommend this pattern for the scarf because it looks equally good both on right and wrong sides.